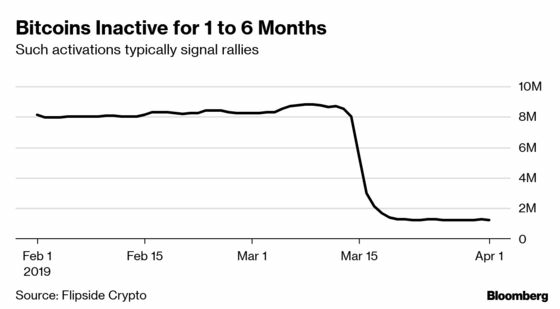 (Bloomberg) -- Small-fry investors were already stirring before this week’s surge in digital coin prices. In the prior two weeks, a high number of electronic storage accounts known as digital wallets holding Bitcoin became active, according to market intelligence firm Flipside Crypto. While 40 percent to 50 percent of all Bitcoins are usually sitting in wallets that have been inactive from one to six months, the average has been about 10 percent since March 15, the firm found. Most often the price moves are the result of a few whales, as large holders are often called, shifting positions, Stone said. That was the case last fall, when Bitcoin plunged 40 percent, he said. This time around, the move was much more broad-based, with many smaller wallets “waking up,” he said. "We see this move much more valid than a few whale moves in October," Flipside co-founder and Chief Executive Officer Dave Balter said. "This probably signifies a change in perception or confidence in this asset class."